Walking tour operator Life’s An Adventure is offering a free night’s pre-tour accommodation in Hobart on select departures for bookings made by August 31. Pre-tour accommodation is the RACV Hobart Apartment Hotel, which offers modern, comfortable rooms with king or twin beds. Clients will be collected from here for the start of tours. Life’s An Adventure’s Three Capes Track walk is pack-free so clients will simply need a day pack for water, lunch and a jacket. Accommodation on the walk features two nights in deluxe spa chalets at Stewarts Bay Lodge, located near Port Arthur Historic Site, and including a la carte meals and local wines. The Three Capes Track is Tasmania’s fastest growing hiking destination. Highlights include the peninsula’s spectacular sea cliffs and pretty eucalypt forests. 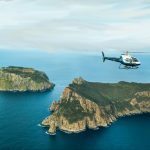 Clients walk to Cape Raoul and Cape Hauy and see Cape Pillar from the air on a helicopter or from the sea on a cruise. Brisbane’s The Calile Hotel … taking bookings for its September opening. Brisbane’s newest accommodation, The Calile Hotel in James Street, Fortitude Valley, is taking bookings for its September opening. Within the hotel guests will be able to experience the hotel’s Lobby Bar, which will offer a contemporary menu for breakfast, evening dining and cocktails created by Executive Chef Kitak Lee. 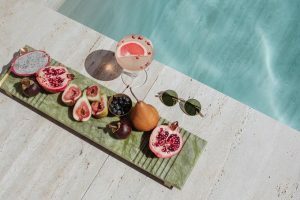 On the pool level, Simon Gloftis will open Hellenika, which will offer a modern Greek menu in a vast floor space that opens to the leafy pool terrace and offers dining under the stars at poolside cabanas. Its 175 guest rooms include nine suites and two premier suites. Each has an individual balcony, Bluetooth sound bar, motorised blackout blinds and complimentary new-release movies. Phone 138 642 or visit www.thecalilehotel.com. 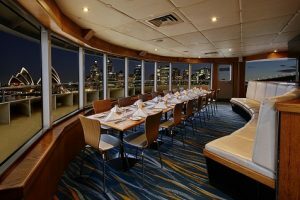 The Sirius Room on board Captain Cook’s MV Sydney 2000 … available from $65 per person. Book a table for 10 aboard a Captain Cook dinner cruise and save up to 40 per cent —and receive a free upgrade to a private room onboard flagship vessel MV Sydney 2000. Prices on the deal, which is valid for sale until August 31 and travel until September 30, start from $65 per person. The MV Sydney 2000 has three dining decks, a 360-degree open top deck and two private function rooms, The Sirius Room and Endeavour Lounge. Both rooms feature private dining and balcony. This special offer is available on the Sunset Dinner, Starlight Dinner, Brilliant Dinner & Drinks and the Gold Penfolds Dinner cruises. Departing at 5pm, the Sunset Dinner cruise provides the best seasonal views as guests witness winter city lights or spring twilight, while enjoying a two-course a la carte contemporary Australian menu, including a selection of sparkling and still wines, beer and coffee. The Sunset Dinner Cruise is priced at $65 per person, instead of the normal $99, when booking for 10 or more people, including a free upgrade to a private room. Circa 1936 … adding some historic class to the Murray’s accommodation scene. This column doesn’t normally mention awards but felt compelled to in this case simply because there are too many classy historic digs along the Murray. Corowa’s boutique hotel and spa Circa 1936 has just taken out the gold award in the Riverina Murray Region Luxury Hotels category of Destination NSW Tourism Awards. The award was announced as part of a gala event held in Deniliquin — home of the annual Ute Muster — with some 130 local tourism operators turning out to celebrate the region’s achievements. 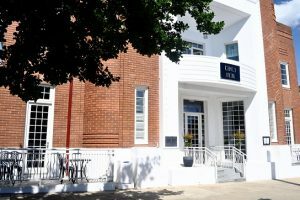 Lovingly refurbished from a former bank — and bank manager’s house — and built in art-deco style in 1936, the three-suite hotel is a landmark in Corowa’s main street, leading to the Murray River. Owners Kevin and Ririn Yaxley purchased the building in 2013, and set about restoring the property’s stylish architectural features while converting it to a luxury hotel and spa with the most contemporary comforts. The Yaxley family has had more good news this week with the green light given to the development of a sister property in the nearby city of Albury. The Circa collection also includes the popular spa Circa 1928 in Wagga. Phone (02) 6033 5371 or visit www.bycirca.com.au. The Mercure Crocodile Hotel … turning 30 this year. Situated in the heart of Australia’s largest national park sits one of the world’s most identifiable hotels, the Mercure Crocodile Hotel which this year is celebrating its 30th anniversary. 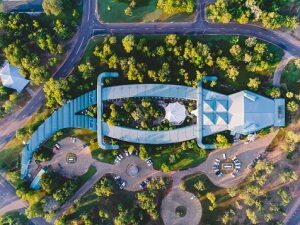 The Indigenously-owned four-star Northern Territory hotel is shaped like a saltwater crocodile and is one of the region’s most famous inhabitants. It’s located in the township of Jabiru, and is a great base from which to explore the World-Heritage-listed Kakadu National Park. The opening of the ‘Croc’, as it is affectionately known, in 1988 followed the worldwide success of the cult movie classic, Crocodile Dundee, which was filmed in Kakadu. Stainforth Waterfalls in the Yorkshire Dales. On Foot Holidays is offering an early-bird discount on all its 2019 self-guided walks across Europe, with Director Simon Scutt highlighting the health benefits of opting for a walking tour instead of more sedentary forms of travel. The early-bird offer enables Australians to secure 2018 prices on all 32 of On Foot Holidays’ 2019 inn-to-inn walks through Europe if booked before September 30 this year, a saving estimated at about 5 per cent. 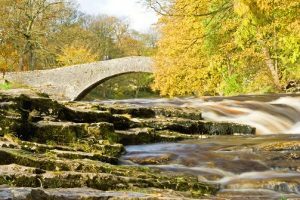 One of the operator’s newest routes is in England’s Yorkshire Dales. The seven-night itinerary takes in pretty villages, market towns, country meadows with drystone walls, babbling brooks, moorland and the 12th-century remains of Fountains Abbey. Including accommodation in country pubs and B&Bs, all breakfasts and all luggage transfers, the medium-hard walk costs from $1275 per person twin-share. 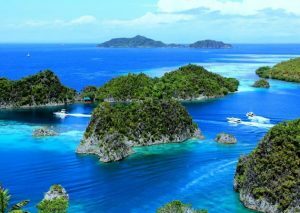 The Raja Ampat region of Indonesia … 612 islands to sail among. Over-tourism and responsible travel are the two big factors influencing World Expeditions’ new active Asian program, with the expanded and enhanced range designed to get travellers away from the tourist hot spots and to deliver a positive environmental impact. The just-released program includes new self-guided pilgrimage hikes and e-biking itineraries in Japan, new cycle itineraries in remote China, new adventures to lesser known destinations in Vietnam, Indonesia and Laos, and two new national park experiences in Mongolia. Japan’s ancient pilgrimage routes feature in the program, with new self-guided hikes on Japan’s World-Heritage-listed Kumano Kodo pilgrimage routes and the Nakasendo Way, all of which are designed for more independent travellers seeking the flexibility to walk at their own pace, yet wanting accommodation organised and luggage transferred. Two new adventure cruises are on offer — one amidst the 612 islands that make up the stunning Raja Ampat region of Indonesia aboard a purpose-built trimaran, and the other a journey down a remote stretch of the Mekong River between Chang Rai and Laos’ cultural capital, Luang Prabang. 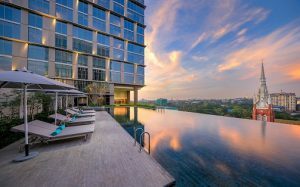 The Pan Pacific Yangon … features include a sensational outdoor infinity pool. Treat yourself to a stay at one of Myanmar’s most popular hotels, the Pan Pacific Yangon. Book before August 31 and stay anytime until January 21 next year for about $175 per night twin-share, including breakfast for two. The hotel is located close to many of the city’s best shopping plazas, street markets and restaurants, and just a short distance away from the famous Shwedagon Pagoda. Add breathtaking city views and a sensational outdoor infinity pool, and it makes the perfect base from which to explore one of South Asia’s most intriguing destinations. Phone 1800 049 610 or visit www.panpacific.com. SeaDream I at Portofino, Italy … one of the most popular of its tiny ports of call in the Mediterranean. The 112-passenger SeaDream I will undertake a nine-day Mediterranean voyage next May, spending three days on the French Riviera, including being there for the 2019 Monaco Grand Prix. It will sail from Rome’s port of Civitavecchia, visiting ports in Sardinia and Corsica and on the Italian and French Rivieras. A yet-to-be-priced package covering will cover transfers and entry for those interested in the Grand Prix. Fares for the cruise start at about $8580 per person twin-share, including SeaDream’s award-winning cuisine, drinks with meals and from the bars, power and sail water-sports, use of the onboard golf simulator and fitness centre, port charges and taxes, and crew gratuities. 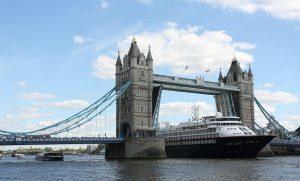 Silver Cloud in London … a Combination Cruises option. Silversea Cruises has announced its new Combination Cruises, which join two or more select voyages into the one experience, allowing guests to spend extended time unlocking deeper travel experiences. Encompassing nine different regions, Silversea has chosen a limited number of balanced voyages, allowing guests to enjoy a lengthened stay, and discover each region in depth. 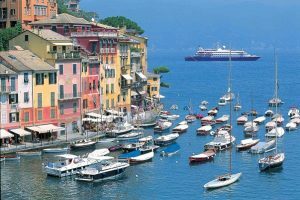 Fares for a 14-night sailing in the Mediterranean lead in from $7600 per person twin-share on Silver Shadow. Classic combinations include Northern Europe and the British Isles, with seven voyages ranging from 17 to 35 days, and fares starting from $11,000 for a 17-day voyage on Silver Spirit. Phone 1300 306 872 or visit www.silversea.com.